We need to go through standard routine of “Safely Remove Hardware” before physically unplugging a USB device drive from the computer. This procedure is long, boring and involves lot of clicking. If you often use USB devices on the computer and is tired of this long “safely remove” routine, get a life using USB Safely Remove application. It is a small application that provides quick menu to remove any USB device connected to the computer. Right click on its icon to see list of devices that can be safely removed from the computer. 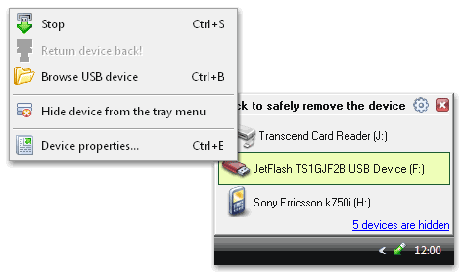 Highlight and right click on specific USB device and click on stop to safely remove it. If you love using keyboard to perform different tasks, you can use keyboard shorcut for safely remove routine using this application. Press Win + S to see menu with listing of USB devices. Use up/down arrow to select specific USB device and hit Enter to stop it. Download USB Safely Remove to make Techno Life easy and quick while removing USB devices connected to the computer.